So Long and Thanks for All the Selfies! THANKSGIVING DAY, November 24, 2016 – As Americans gather around the Thanksgiving tables this afternoon to make the traditional Thanksgiving duck lips and peace signs in front of our cameras, I think we should take time out to have a look at what we should be thankful for this year. Especially from an Instagram point of view. The Thanksgiving selfie (what I am hoping that we will begin to call the “turkie”) shows us how much we have progressed since 1653. We have much about which to be proud and thankful. Today we take our selfies seriously. Making sure that the Thanksgiving meal is in the background, maybe part of granny’s nose and a couple of cousins (and their smartphones too), we digitize and share a wealth of photos of ourselves. The original Plymouth pilgrims could only dream of such bounty. It does not matter who has spent the better part of week in the kitchen and supermarkets preparing the Thanksgiving feast – in fact, it would be better to order it in and use props. How much time would be lost in having actually to be grateful and acknowledge the effort! When would be have time to practice pouting our lips, making bedroom eyes, and arranging our hair? Imagine the disastrous selfies that would ensue! They could NEVER be posted! This is not a cynical Thanksgiving blog that bemoans the loss of community and family values in a modern world. This is also not an indictment of the narcissistic impulse to self-photograph in any circumstance. Such laments are a waste of time. What we want is to take as many selfies as we can and Thanksgiving – a time of sharing and thinking of others – is the perfect time. “Look at me sharing and thinking of others!” (Duck lips). 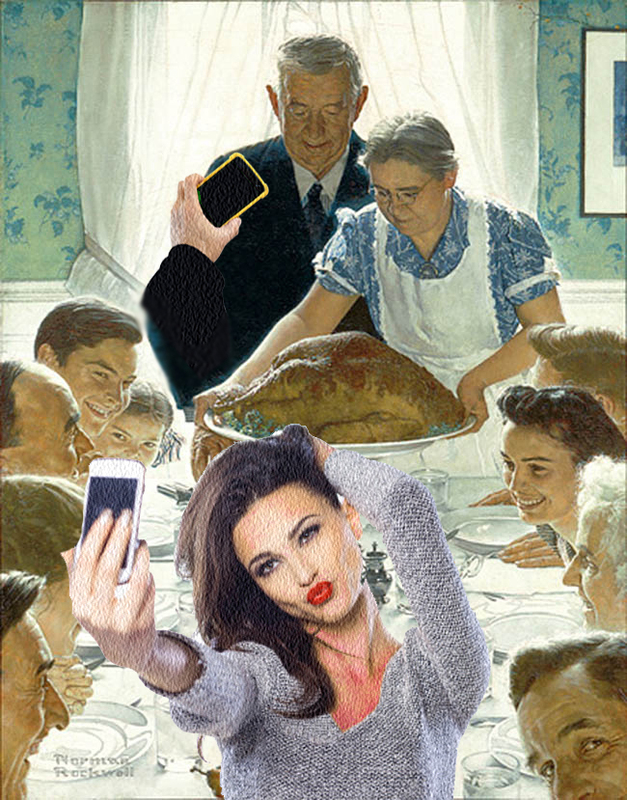 Thanksgiving Selfies, it may be argued are in much better taste than Funeral Selfies (I have seen these). After the floods in Serbia of a couple years ago, there was also a spate of “Helpies” shot by selfless individuals as they helped flood victims (peace sign). In short, any time is a good time to shine the spotlight on ourselves. So let’s be thankful to Apple and Samsung and their gift to us of 12-megapixels. Let us exalt the apps that allow us to superimpose cat features on our selfies. It is a time of thanksgiving after all. After we put away all the food props and pack up the leftovers (#leftovers > click), we speed away to begin posting furiously the wealth of selfies that Thanksgiving has provided. Share. Like. Love. Tag. #givingthanks. So long, see you next year! And thanks for all the selfies! This entry was posted in Essays and tagged Apple, Chris Farmer, duck, family, narcissistic, peace, post, Samsung, self, Selfie, selfies, share, tag, Thanksgiving, The Standard Deviation, turkey. Bookmark the permalink.